Along with the Vent Reservoir, the Vent Insert is an integral part of Dr. Brown's Patented Internal Vent System, which allows our bottles to work differently. Vent Reservoirs are exclusive for the standard 8 ounce Dr. Brown's Natural Flow baby bottles. 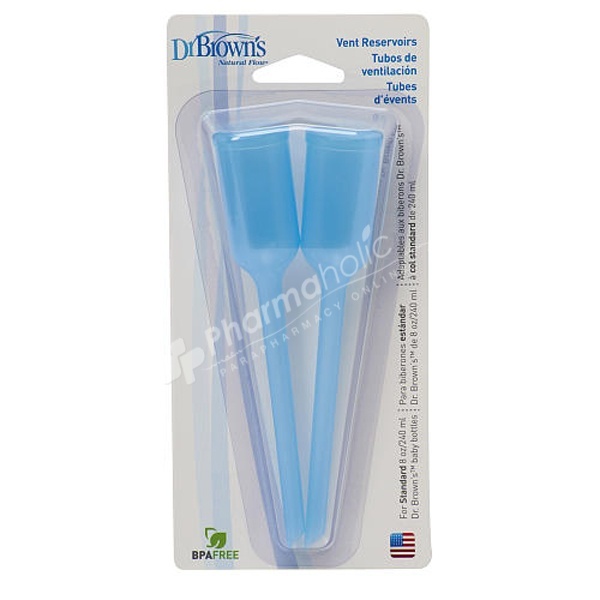 They are the exact pieces that come with each standard 8 ounce Dr. Brown's Natural Flow baby bottle and are meant to replace worn or lost vent reservoirs. These vent reservoirs are an integral part of the Dr. Brown's patented internal venting system. Same as the vent reservoirs that come with the Standard Dr Browns 8 oz bottles. Designed to replace worn or lost pieces. All components of the Dr.Brown's natural flow baby bottle are top-rack, dishwasher safe. Wash all parts prior to use. Do not let a child take a bottle to bed or self-feed for long periods.